My second blog concerned perceptions of Indigenous parenting capacity. Some think that the way non-Indigenous people assessed Indigenous parenting, i.e. according to Western standards and norms, with no understanding of Indigenous culture, was a large factor leading to the Stolen Generations. Back then (and also today I fear) I feared that a new stolen generation may emerge. Have we learnt nothing from the past? Why do we care so little about the future of our Aboriginal brothers and sisters? 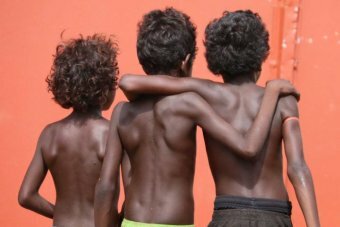 The number of Indigenous children removed from their families is set to triple in the next two decades on current trends, a new report has warned. The report is being released at Parliament House in Canberra today by Family Matters — a national coalition of 150 Indigenous leaders and child protection bodies. The group will urge the Federal Government to adopt a new national strategy and a Closing the Gap target to reverse the growing numbers of Indigenous children in the child protection system. Indigenous educator and Family Matters ambassador Dr Chris Sarra said "too many" Aboriginal and Torres Strait Islander children were being separated from relatives. "There is a crisis and we need to do something about this," he said. Currently 15,000 Indigenous children are living in out-of-home care, and were nine times more likely to be removed by authorities, the report said. "Those numbers scream out at us that we need to do something differently and we do need to set targets," Dr Sarra said. The Family Matters coalition wants the over-representation of Indigenous children in out-of-home care eliminated by 2040. "We need to get very deliberate about acknowledging that high number of children that have been removed, and be committed in a tangible way to returning those children to those families and communities in a way that is safe for them," Dr Sarra said. The report said too much money was being spent by state and territory governments on crisis responses, instead of rehabilitation services for vulnerable families. Seventeen per cent of overall child protection funding is spent on support services, the report said, with the bulk of funding — $3.5 billion — spent on removing and caring for children. Dr Sarra said he thought there had been a "big stick" approach to child protection in Indigenous communities, with little collaboration with parents. "It's time that this level of resilience and skill, and also the level of love we have for our children, is acknowledged and embraced," he said. The Family Matters report said that represented a vast jump in the rate of removal since the landmark Bringing Them Home report on the Stolen Generations was released in 1997.